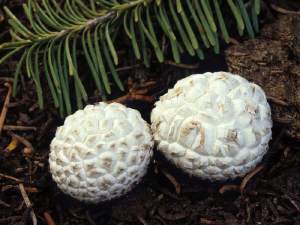 Description: Fruiting body: 8 to 15 cm across, 6 to 9 cm high, nearly round or sometimes a bit broader; whitish to dingy; covered with flattened warty scales with grayish tips and brownish hairs at the center; plaques fall away when mature. Spore mass: white becoming yellow then olive-brown. Sterile base: one-quarter to one-third of mushroom; dull, white, firm. Habitat: Singly or scattered or in small groups in open areas along roadsides and wood edges in subalpine places, April to August. Sometimes abundant. Primary Keys: Large white puffball with warts. Edibility: Choice, if the spore mass is still white! Note: some puffballs may have a laxative effect on individuals. As always, test first. Notes: A much larger and generally smoother cousin is Calvatia booniana (Giant Western Puffball) from more arid regions. Another is Calvatia sculpta (Sierran Puffball) which is very similar except the warts are much longer & pointed, from the Sierra only. A third and smother relative is the monster in the family: Calvatia gigantea (Giant Puffball), which can reach 60 inches and 50 pounds! They are also choice edibles. Like all puffballs, make sure: 1) it’s not an immature Amanita “egg”; 2) the spore mass is pure white; 3) there are no maggots. Blend olive oil and one clove of garlic. Heat 2 T. garlic oil in heavy medium saucepan over medium heat. Add pancetta and saute 2 minutes. Add onion and remaining garlic, saute until tender, about 8 minutes. Add rosemary and red pepper and saute 1 minute. Add tomatoes, tomato paste, and water. Simmer until sauce is thick, stirring occasionally, about 1 hour. Add salt and pepper to taste. Cool. Preheat grill to hot. Brush oil on sides of the slices and sprinkle with salt and pepper to taste. Grill 2 to 3 minutes per side until marked and soft. Place broiler rack 3 inches from heat and preheat to hot. Place grilled puffball slices on broiler pan, spread sauce, and top with cheese. Broil until the sauce is bubbling and the cheese is golden brown, about 2 minutes.